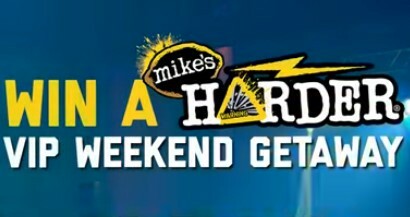 Mike's Harder Lemonade is giving away a trip worth $7000 to Las Vegas, Nevada for one lucky winner and their guest to have a Mike's Harder VIP Weekend! Winner will receive a VIP Getaway Trip for winner and one (1) guest to Las Vegas, Nevada. Winner’s guest must be 21 years of age or older. Prize includes roundtrip coach airfare from airport nearest winner’s residence, transportation to and from the airport in Las Vegas, hotel accommodations in Las Vegas, Nevada for two (2) nights, three (3) days for winner and one (1) guest based on double occupancy, experience/activity in Las Vegas for winner and his/her guest up to a total retail value of up to $1,000 and one (1) $1,000 Gift Card. Approximate Total Retail Value of Prize: $7,000.00. HINT: If you prefer to text to win there are instructions in the official rules as well as the video below. This Sweepstakes ends on 12/31/17 and you can ENTER DAILY to win.